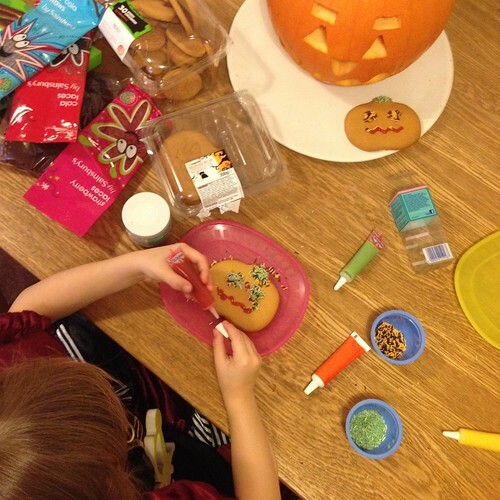 Halloween biscuit decorating, a photo by PhotoPuddle on Flickr. I'm so proud of my daughter. So far this week she has been given a glowing report at her first parents evening and has also achieved her first badge in her gymnastics class. I therefore thought a photo of her as today's blog post would be a good idea. Here she is decorating biscuits on 31st October. She gets really excited about halloween which is kind of funny because she also gets freaked out by anything too scary. You obviously can't tell from this but she is dressed as a pirate so nothing too frightening! This photo also reminds me that I love photos taken from above like this especially of tables with food on. I must try and take a few more. And share them here of course.